Gemini Twin is a slot game from Novomatic that makes you see double! In astronomy, Gemini is one of the 88 constellations. The name ‘Gemini’ means ‘twins’ in Latin. In astrology, Gemini is one of the twelve star signs and its symbol is a pair of twins! Geminis are said to have dual personalities and people who interact with them will never be quite sure which side of their personality they will be faced with! In this slot game made by Novomatic, there are two sets of reels. They are identical twins and you won’t be able to tell them apart from each other! Until, of course, they start spinning and show different symbols. Each set of reels is made up of 4 reels (3 positions each) and 10 paylines. The 10 paylines follow the same exact paths on both sets of reels. Half of the paylines run from left to right and the other half run from right to left. Gemini Twin is a new slot game but it’s made to look super vintage. You’ll love the old-school style of this slot. The design actually makes it look like a retro slot machine. The reels are in front of you, on the face of the slot, and underneath you can change all of the setting on the ‘buttons on the front panel. 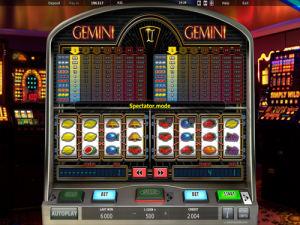 Famous, fruity slot symbols are among the cast of Gemini Twin, alongside some old-school slot symbols from back in the day. This game might be a bit confusing for an absolute beginner but for anyone with basic slot knowledge, it can be a real fun game to play – in fact, twice as fun! Novomatic make several other games like Gemini Twin and these include: Cash 300 Casino, Club 2000, Star Lotto, Random Runner 15, Magic 27 and Hold It. Both sets of reels have the same symbols which give out the same wins. These are: cherries, lemon, orange, plum, strawberry, watermelon, bell, diamond and bars symbol. The game is played in coins and you can choose the value of each coin. You can play the game betting 1 coin per spin, 2 coins, 5 coins, 10 coins, 20 coins, 50 coins or 100 coins per spin. You can play on each set of reels individually or you can play on both simultaneously. You can bet 1 coin on one set of reels and 50 coins on the other – it’s totally your choice! Each set of reels has its own spin button or there’s one in the middle that spins both. Each payline covers three positions and so each symbol has a x3 payout. You can see all of the payouts displayed (in coins) on the slot face, above the reels. However many coins you choose to bet per spin, the relevant win amounts will be highlighted above each set of reels so you can see how much you stand to win! Don’t forget to look on both sides of the reels and some paylines pay from the right and others pay from the left. You can play Gemini Twin in autoplay mode but there isn’t a gamble option available. Novomatic couldn’t just be one constellation – this developer makes so many online casino games, it must be a whole galaxy all to itself! Here at NovomaticCasino.co.uk, you can play all of their slots, video slots, mobile slots, table games and live games for fun. Our team of experts have reviewed all of their games and so you can read about their features and their payout percentages. Although Novomatic slots are designed around many different themes, a lot of their slots do share the same features and aesthetic. Novomatic fans love this because they have come to count on their good name. You know that when you choose to play a Novomatic game, it’s going to be a good one! If you want to play Gemini Twin for real money, or any of Novomatic’s other games for real money, you can play at an online casino. Our team has reviewed several online casinos that provide Novomatic games. Read all about their Welcome Bonuses and promotional offers before choosing which one to sign up with!